Dubai: Travellers can now hop on to a Roads and Transport Authority (RTA) bus for a trip to Muscat for as little as Dh55. On Monday, the RTA in partnership with Mwasalat, Oman’s national transport company, launched three daily bus trips to and from Muscat. Passengers can embark on the trip from three locations in Dubai, with the route starting from Abu Hail Metro Station and heading to Muscat via Dubai Airport Terminal 2 and Rashidiya Metro Station. The buses will stop at these stops on the way back as well. “This partnership between the RTA and Mwasalat will help passengers travelling between Dubai and Muscat access a world class bus service from three key locations in Dubai. These stops have been carefully selected because they are multi-modal stations providing access to metro, taxis, local buses as well as air connectivity in the case of Dubai Airport Terminal 2,” said Ahmad Behroozian, CEO of RTA’s Public Transport Agency, speaking with Gulf News following the launch of the bus route. The one-way journey, which lasts six hours costs Dh55, while a round-trip ticket costs just Dh90. The three daily buses will start at 7.30am, 3.30pm and 11pm and tickets for the trips can be bought over the counter at all three stations. Behroozian said the tickets will be initially available only over the counter, while in the next stage online ticketing system and Nol payment option will also be available. On the way to Oman, the bus will stop at Al Wajajah Border near Hatta, for immigration and customs formalities. Expats embarking on the bus trip from Dubai will require a valid visa for Oman and in case of those who qualify for the visa on arrival facility can get the visa stamped on their passport at the Omani side of the border crossing. Emiratis and other GCC nationals can travel visa-free and only need to carry their national identity cards to pass through the border. In Oman, the buses will begin their trips at 6.20am, 3.20pm and 11.20pm with eleven stops either way, including Athiba Station in Muscat, Muscat Airport, Sahwa Tower, Maabelah, Barka, Musanah, Suwaiq, Khaburah, Saham, Sohar and Shinas. With a capacity of 50 passengers, the luxury buses have latest tech features, including free WiFi, adaptive cruise control and drive assist for additional safety. 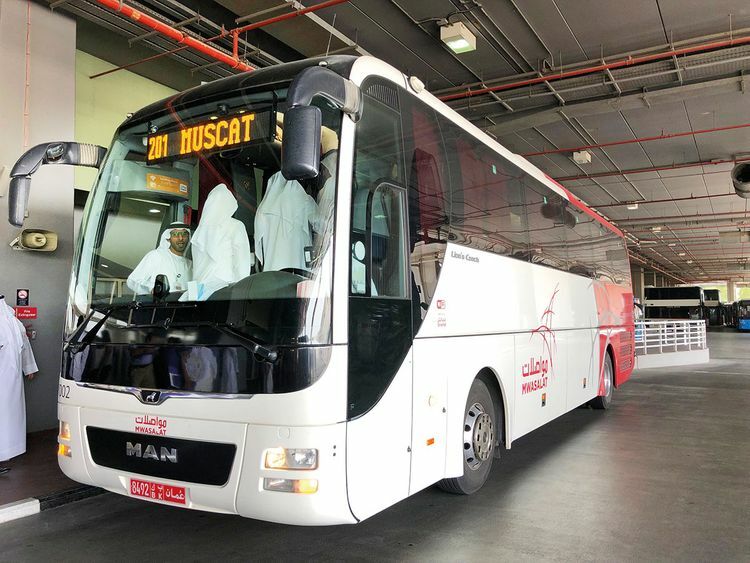 The Dubai-Muscat bus service by Oman’s Mwasalat has been running for several years with three daily buses with only stop from Dnata head office. Ahmad Al Beloushi, CEO of Mwasalat, said the new joint offering will add value to existing services with new buses and more stops. “We are keen to ensure the safety and comfort of passengers travelling between Oman and the UAE aboard safe and comfortable coaches, custom-built for long trips. I hope this step will herald the start of an integrated transport network between the two nations,” said Al Beloushi. Apart from the government-operated buses, several private transport operators also run daily buses between Dubai and Oman. Tickets: one-way Dh55, round trip Dh90. Stops: Three in Dubai and 11 in Oman. Dubai stops: Abu Hail Metro Station, Dubai Airport Terminal 2 and Rashidiya Metro Station. Oman stops: Athiba Station, Muscat Airport, Sahwa Tower, Maabelah, Barka, Musanah, Suwaiq, Khaburah, Saham, Sohar, Shinas. Border crossing: Al Wajajah (Hatta). From Dubai: 7.30am, 3.30pm and 11pm. From Muscat: 6.20am, 3.20pm, 11.20pm. Visa on arrival is available for several categories of expats, while those who are not eligible for visa on arrival can apply for a visa at the Embassy or Consulate of Oman. Expats travelling by the bus need to carry a valid passport.